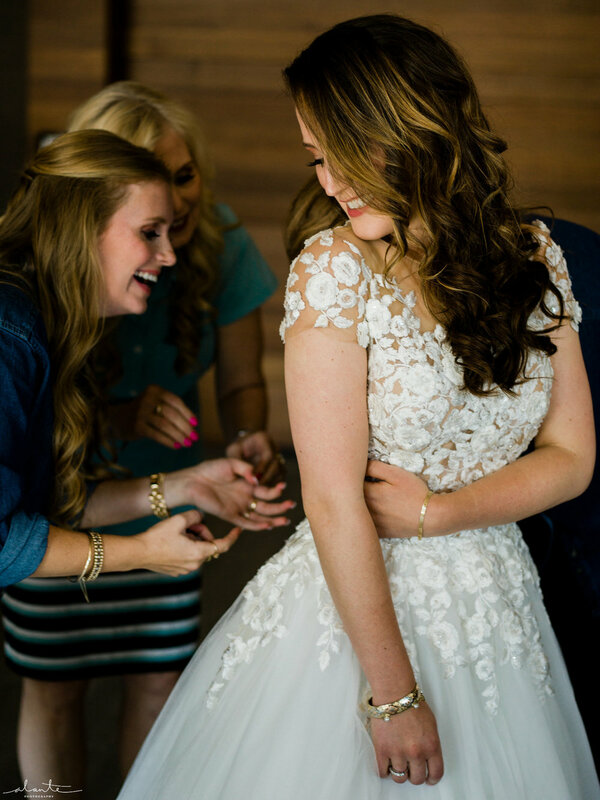 We are always listening to our brides as we help them find their dream wedding dresses, and one topic that continuously comes up is how to look and feel great on the wedding day. We thought that this would be the perfect topic to write about after all the Thanksgiving holiday festivities. To help our brides, we partnered with Melanie Kotcher and Rachel Paul from Complete Wedding Wellness to get expert advice on nutrition and fitness to fuel the big day and even afterwards. They work with hundreds of brides - providing personalized Pilates workouts with Melanie and individualized nutrition coaching with Rachel. Get their free week of meals and workouts here! Nutrition: If your goal is weight loss, and you have 20+ pounds to lose, slow & steady results are best to keep your metabolism as high as possible. Trying to lose a significant amount of weight early on can potentially sabotage results, because keeping up with a significant calorie deficit or strict regiment gets old after a while, especially if the end is too far from sight. Ideally, you should try to shop for your wedding dress close to your goal weight so that you are not stuck with a huge alteration bill or stressed if the dress doesn’t fit or look the same way on your new shape. Exercise: The first step to getting fit and strong is to set specific goals and make a plan for yourself. For example, do you want to sculpt your arms? Are you looking to strengthen and tone your core (including obliques)? Everyone has different lifestyles and needs and start at varying fitness levels - which is why specific, customized goal-setting is very important. Also, start slow and try to schedule in time for a new fitness class, running, and active recovery days every week and see how many times per week works best for you. Remember to track your progress by taking measurements or notes on how your clothes are fitting and applaud your good work and alter your plan if necessary. To help you achieve your goals, it might be beneficial to have an accountability coach by your side. If not, make time to work out with your close friends (or wedding party!) to make it a fun, social experience. Nutrition: We recommend sticking with a diet full of a variety of colorful vegetables (different colors yield different nutrients), protein sources (like eggs, salmon, chicken, etc. ), and fats (like avocado, olives, guacamole, and nuts). If acne is a potential issue, limiting dairy products (like cheese, milk, and yogurt), and being sure to stay hydrated with water or seltzers (if they don’t contribute to bloating) may be beneficial. If bloating and gastrointestinal discomfort is a serious issue, try cooking the vegetables you eat, as cooked vegetables are typically easier to digest than the raw varieties. Tracking what you’re eating with an app can also be very helpful during this time, as having objective measures of what is working can decrease stress. Exercise: Now is the time to take a look at your progress and tweak your plan, if needed. Perhaps that means challenging yourself by adding an extra day of working out per week or increasing the intensity or length of certain workouts for more enhanced results (just remember to keep those active recovery days and stretch before and after workouts to help prevent injury). If all is going according to plan, then that’s great! Now is the time to have even more fun with your workouts. Try new fitness classes, take your runs outdoors and in new neighborhoods, tweak your playlist, and make more social activities fitness-related. Continue to track your progress with an app for accountability, and it’s also important to allow time to be proud of yourself. You’ve been at this for several months now so don’t get too keen on numbers with a tape measure or on a scale - consider how far you’ve come and give yourself a pat on the back. Nutrition: A new way of eating or eating foods your body may not be used to is unwise on this important day. For example, if your diet is not generally comprised of many foods high in fiber, like cruciferous vegetables, beans, and whole grains, it would not be advisable to eat these types of foods the day of. These foods can cause some bloating and gas in some people, especially if they’re not generally present in the diet. Foods that don’t generally cause bloat and are easy to eat on queasiness include eggs, chicken, cooked vegetables, brown rice, whole grain toast, and quinoa. Exercise: For the night before the big day, it’s very important to continue to stick to your fitness routine. Many brides find that an active recovery day such as light yoga and/or stretching is the most beneficial. This type of workout can help release nerves and tension both physically and mentally for a better night’s sleep. Work with Melanie & Rachel! Check out more information about Melanie and Rachel's services and their amazing Complete Wedding Wellness Package by signing up for a free strategy session HERE. They are also providing Our Story Bridal savvy brides a free week of their nutrition and fitness plans, accessible here! As always, to find your dream dress for less and without the stress, make an appointment today with Our Story Bridal.